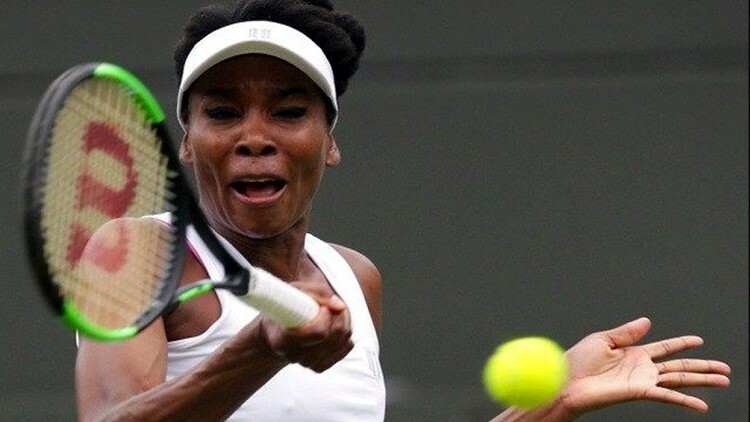 LONDON (AP) — Venus Williams won her first tennis match since being sued by the estate of a Florida man who died after a car crash police say she caused. The 10th-seeded Williams beat Elise Mertens 7-6 (7), 6-4 Monday in the first round at Wimbledon, a tournament the American has won five times. "There are really no words to describe, like, how devastating and ... yeah. I'm completely speechless," Williams said before tearing up. On No. 1 Court, Williams had to wait through a 33-minute rain delay to win her opening match. She had two match points before the rain came. Play was stopped with Williams leading 5-3, 40-40 in the second set. Murray entered the tournament after pulling out of a pair of exhibition matches because of a sore hip. "I was a bit nervous this morning," Murray said. "I hadn't been able to do as much as I would have liked in the buildup." Petra Kvitova, a two-time Wimbledon champion who was injured in a knife attack at her home in December, then beat Johanna Larsson of Sweden 6-3, 6-4 on Centre Court while Rafael Nadal defeated John Millman of Australia 6-1, 6-3, 6-2. Second-seeded Simona Halep and No. 17 Madison Keys also won. Halep, who lost in the French Open final, beat Marina Erakovic of New Zealand 6-4, 6-1. Keys defeated Nao Hibino of Japan 6-4, 6-2. Keys, who is right-handed, was playing for the first time since having a second surgery on her left wrist. "It's obviously not perfect," Keys said. "I haven't been able to do the repetitions that ideally I would have wanted to do, but it feels fine. Doesn't hurt anymore. That's really all I care about." Fourth-seeded Elina Svitolina and eighth-seeded Dominika Cibulkova also advanced. In the men's draw, Nick Kyrgios retired from his first-round match after losing the first two sets. The 20th-seeded Australian was trailing Pierre-Hugues Herbert of France 6-3, 6-4 when he called for a trainer to work on his left hip. He then decided to stop the match. Kyrgios also retired with an injury from his first-round match at Queen's, a Wimbledon warm-up tournament. "I kind of knew I was in trouble. I have been feeling my hip ever since I fell over at Queen's. Never got it right," Kyrgios said. "I was doing everything I could to help it, but just not enough time." Two-time semifinalist Jo-Wilfried Tsonga also reached the second round. The 12th-seeded Frenchman beat Cameron Norrie of Britain 6-3, 6-2, 6-2. Fifth-seeded Maric Cilic, ninth-seeded Kei Nishikori and 24th-seeded Sam Querrey also advanced.